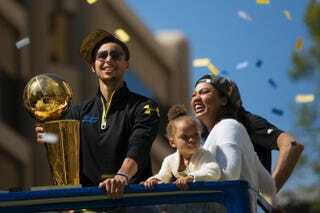 Stephen Curry of the Golden State Warriors; his elder daughter, Riley; and his wife, Ayesha, smile during a victory parade in Oakland, Calif., June 19, 2015, celebrating the Warriors’ first NBA title in 40 years. Riley Curry took the NBA semifinals by storm with her precociousness and spunky 2-year-old personality, and now she’s about to tackle an even bigger job: big sister. Riley’s parents—NBA star Stephen Curry and his wife, Ayesha—are celebrating the arrival of their newest addition. Ayesha Curry gave birth to a 6-pound, 1-ounce baby girl named Ryan Carson on Friday. She wrote about giving birth to the small bundle of joy and even accomplishing it without an epidural. Let’s just say Ayesha Curry may be the true MVP of the Curry family! So how’s Riley coping with the newest addition? Well, you can’t expect anything less than excellence from Riley. Ayesha Curry says that Riley is "completely enamored with her little sister and has taken on her role as big sister beautifully."